We've had a lot of snow days this winter -- 7 so far. Last week, my friend Julia started the Snow Day Challenge. The challenge is to not make a panic run to the grocery store but to cook something creative with what you have in your pantries. Julia is no slouch, so we kept throwing down dishes and posting them on Facebook. On the first SDC, I made seven dishes, and Julia made eight, including her finale which involved mixing leftover bottles of red wine to fill her drinking glass. I declared her the winner on that one, and on her banana cake which involved using a random frozen banana she found in the freezer. The past two days was SDC 2.0 as we got snow and then ice. These wings were dish #7. With this round, I decided I was going to make things I hadn't made before or use a new technique. With the wings, I decided to use David Chang's technique at Momofuku for fried chicken, which involves steaming the chicken first and then a quick fry. I steamed the wings in my indoor smoker/steamer for 20 minutes. It's a great technique for prepping wings in advance, such as for the Super Bowl or other party, and I'm sure you could finish them off on the grill instead of deep frying them. As for the recipe, I found a recipe in Steve Raichlen's cookbook, , which is a great cookbook by the way. It's for Dimple's Jamaican chicken. Here's a link to Steve Raichlen' cooking forum and a reader making this recipe. 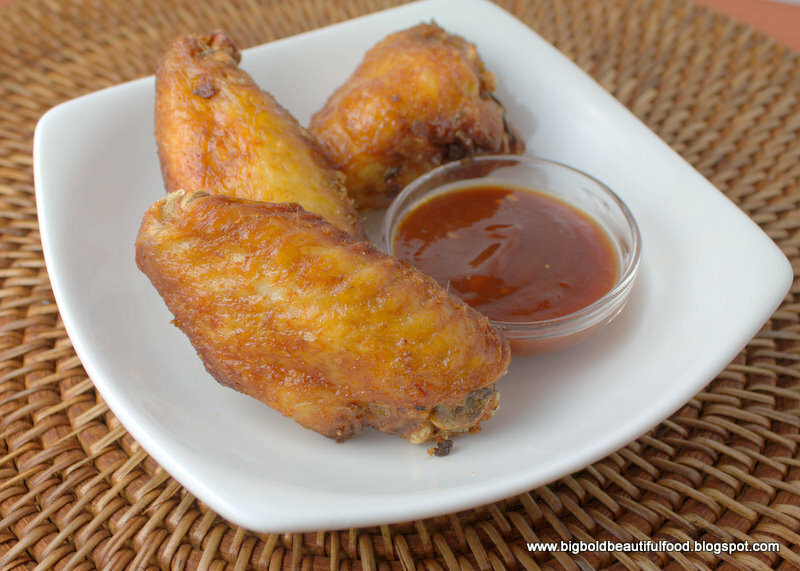 Combine the marinade ingredients in a bowl or in a Ziploc bag if you're using chicken wings. You can puree the ingredients together if you want a richer flavor. Set aside. Rinse chicken wings. Put them in the Ziploc bag with the marinade ingredients and "smush" the bag, distributing the ingredients evenly over the wings; if there's not enough liquid to distribute, add more soy sauce. Refrigerate for 12-24 hours, turning the bag over several times. Make BBQ sauce by combining ingredients except for the rum in a saucepan and simmering for 10-15 minutes, until thick and richly flavored. Add rum during the last two minute, taste for seasoning and adding more rum if necessary. Remove from heat. You should have about 2 cups. Steam wings (I have a Cameron's indoor smoker which I also use as a steamer) for 20 minutes. When done, dry off on paper towels. Heat oil to 375 degrees and dry for 4 minutes or until nice and crispy. Serve with BBQ sauce. Wow that's an impressive throw down. I don't know if I'm that brave. Love the chicken!